It’s no use denying that the modern 21st century world becomes more and more unfriendly. The spirit of it is the spirit of competition and rivalry, and an encouraging atmosphere for aggressiveness. At the end of the 20th century, A.A. Kadochnikov was the first to make the theory of survival a science. His system gives everyone a chance to get the knowledge, skills and tricks that remained secret for ages. If you’re looking for a simple and reliable system of personal development for raising the safety of your life, your health level and mental stability suitable for anyone of any age, this presentation may be of interest and use to you. Soon enough you’ll get to know why. There are vulnerable spots on every part of human body and one should be able to get to them as fast as possible. Soon enough we’ll talk about this and also about the secrets of “the invisible weapon”, the key part of the Kadochnikov system, that distinguishes it from any other hand-to-hand systems and make it easy to grasp. But before we proceed to it, we should turn your attention to the problem that makes a modern person weak, preventing them from behaving properly in any situation of conflict. The thing is that the culture we nowadays are part of proclaims certain values. We are called to be decent with people around us, to be loyal and tolerant. Starting with childhood we are instilled that belligerent people have to pay for their aggressiveness by being unpopular and isolated. Public conscience is installed with the concept of correctness, politeness and cooperation. 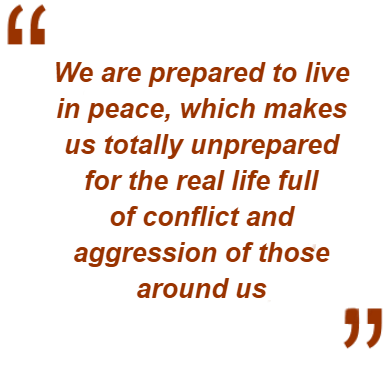 In other words, the problem is essentially that we are prepared to live in peace, which makes us totally unprepared for the real life full of conflict and aggression of those around us. It makes no sense to deny that the modern world of the 21st century becomes more and more unfriendly. The spirit of it is the spirit of competition and rivalry, and encouraging atmosphere for aggressiveness. All is nice and peaceful only on the outside. But on the inside it is the dog-eat-dog world. Society may deny it, may continue painting in rose colors, but many of us are already aware of the truth due to the aching scars left after facing it. Of course this doesn’t mean that we can’t live in compliance with the ideals of peace, friendship and unselfishness. A lot of people dream of it. However each of us has had fits of anger or aggression, which are hard to fight. In the past people could hope to be cared for by some structure – the state, a social organization, family or friends. But it is no longer so. That is why nowadays it is not the ideals of non-aggressiveness turning us into a submissive victim we need,..
but the practical skills and knowledge that will help us to behave correctly in a situation of conflict to come out victorious. We are not talking, of course, about learning to wrench out things from somebody’s hands or, vice versa, being forever defensive. It is about being able to reason, think ahead, think strategically and correctly channel one’s own aggression whenever there is a conflict instead of suppressing or negating it. If there’s an ideal to aspire to, it is an ideal of a strategist-warrior, able to be in control in complex situations and conflicts thanks to skillful and reasonable actions on any level – physical, spiritual, intellectual. Such a person in our system is called a safety person, whose invisible weapon is personal safety technique. Let us explain you in short why we prefer to use the term “personal safety technique” speaking of what we do and what we teach others, instead of the common names, such as hand-to-hand combat, self-defense, survival techniques etc. The thing is all of the above mentioned collocations describe different aspects of particular situations, when one may need any skills and knowledge of how to use them. Only when the objective is strictly defined, are we able to speak of some particular methods that depend on the aims and tasks at hand. For instance, a hand-to-hand fighting program for soldiers will be different from the one for police officers. It is connected to the difference in the tasks and the rules they are guided by, despite the fact that in both cases it is about professionally applied training. And yet the practical skills and knowledge of correct behavior in a situation of conflict is needed by any man to ensure their safety, honour and dignity. Such universal skills, effective in any situation of everyday life, at the time of consciously mastering them are hard to put in the Procrustean bed of a particular method whatever it is called. ... could be applied to the Kadochnikov system, as all of them are suitable, but none of them is enough to fully show the essence of it. Why do we call them universal? Because on the grounds of them, we can effectively and adequately interact with any everyday situation and solve the arising problems. Why do we need the algorithms of correct and adequate motor skills? The thing is that in a life-threatening situation characterized by stress and lack of time for reasoning, the only thing a person unprepared can count on is reacting instinctively, which is usually of the lowest quality. Mostly not. Specialists are aware of the fact, that if you make an untrained person parachute from an aircraft, the chances are that they will not survive it. One could think that a parachute is the only necessary thing, and one should only guess how to make it open. Yet under the pressure of the situation it is almost impossible to do unless you are trained beforehand. After training almost everybody can land successfully, even elderly people or housewives, enjoying extreme sports as a hobby. 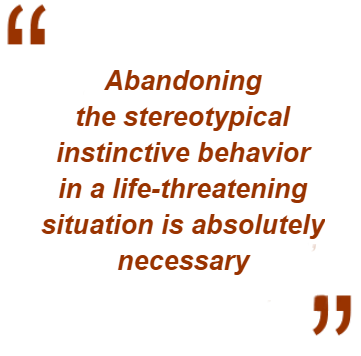 This is why abandoning the stereotypical instinctive (i.e. non-effective) behavior in a life-threatening situation in favor of effective models of behavior and motor skills are absolutely necessary. And here we are, standing right beside the concept of counter-instinctive or scientific approach. Why do we call it scientific? Because mastering the fighting algorithms start with one of the fundamental scientific principles – “ex adverso” or to the contrary. It means that the process of learning is started by assuming that the worst has already happened. Then we’ll calmly analyze the actions to be taken to avoid “the worst”. Let’s examine a number of particular situations to make the principle crystal clear for you. Let’s imagine somebody attacks you with a bat from above. If you start panicking, trying to avoid the attack or run from it, the chances are that sooner or later the blow will come. You defend, try to keep the distance, put the arm under the hit or just avoid it. With such a model of behavior the result is quite predictable – only the time is in question. But if you change the model and start behaving as a predator instead of the prey, you can turn the tables. You no longer avoid the bat, but move in its direction, you arm softly enters the plane of the attack. 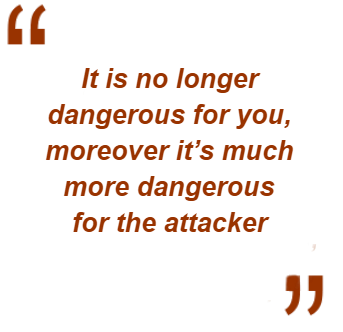 it is no longer dangerous for you, moreover it’s much more dangerous for the attacker, who has not understood yet that it’s no weapon he is holding, but a lever of force or speed, using which you can control him like a child. He should have let go of the bat at the moment you took over the initiative. He is acting by instinct, continuing with the scenario of his aggressive behavior, yet all his aggression and physical efforts are turned against him and multiplied by the lever. He stands no chance. To counter your model of behavior he has to be able to act counter-instinctively. But one has to learn that. When we talk about learning we don’t mean training, but at least a short introductory course of effective behavior in a life-threatening situation. Another example, if you are seized by the arm, what’s your first reaction? Presumably, to pull away, right? But is it effective from the point of view of the system we use here? What is expected of you by the opponent? What is he ready for? Indeed, that you’d try to pull away, as a model victim. What would catch him unawares? He’d be surprised, if you won’t even think of pulling away, but will softly shift the center of mass in such a way, that the load at the place of the seizure will be reduced, and find the pivot. The opponent will find relaxation at the place where he expects tension. The only thing you’ll have to do then – to form the correct lever and apply the force in the right direction – the opponent will be dumbfounded. Moreover, he won’t even understand that he is not the predator anymore, but the prey. That’s how it works. for situations of conflict, than perfect a dozen of holds you’ll never be able to use because of the instinctive reactions of your body. It is a natural reaction of your system when leaving the comfort zone. ...for our wellbeing, health and life, without being trained and prepared for it we start panicking. The implications are of an obvious nature. That is why we need the fighting algorithms of personal safety technique. Such algorithms are the basic set of motor skills natural for the body, which will allow you to react correctly to any situation at a counter-instinctive (i.e. efficient) level. one should choose a number of the most useful, universal, applicable to any environment (cold or warm, sandy or icy, restricted, standing or prone etc. ), do not require any physical qualification (one can be ill or injured) and are easy enough to master. Being able to use such algorithms you shorten the time necessary to get the skills for the right behavior and effective motor activity by a dozen or even a hundred. It is the understanding of necessity of the algorithms for the forming of effective more skills and abandoning ineffective motor and behavioral stereotypes that is one of the basic concepts of the Kadochnikov system, which is essentially different from its counterparts. It is based not on the brutal physical force, but on the clever and cunning interaction with the opponent. Mind you, they can be much bigger and stronger than you are, or may exceed in numbers. What Do You Do if the Opponent Is Twice as Big? What if They Are Numerous and Armed? In such a situation the only thing that can save you is the skill of specific fighting algorithms of personal safety technique. They might seem unfair. Yet they will be effective. Really effective. 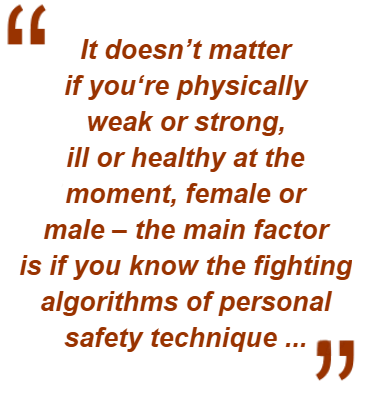 It doesn’t matter if you‘re physically weak or strong, ill or healthy at the moment, female or male – the main factor is if you know the fighting algorithms of personal safety technique, not the muscles and aggressiveness. Being aware of these seven factors it will be of no difficulty for you to decide which of the training programs is suitable for you, and get to know of the result you will get. The FIRST and foremost difference is about mental preparation. 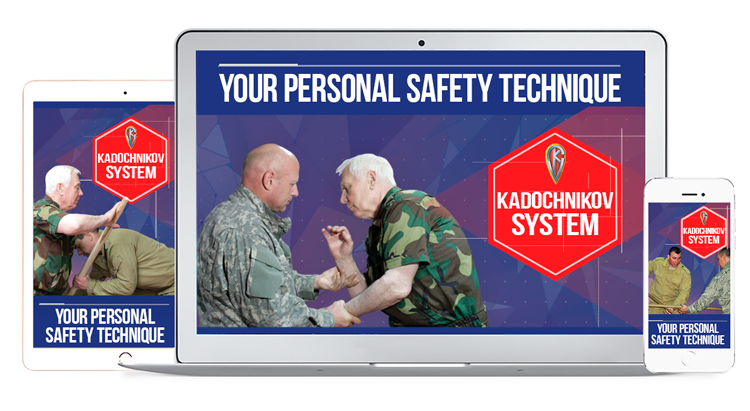 The Kadochnikov system prepares your psyche for effective functioning in extreme situations, when your wellbeing and life are in danger. Any martial art taken as a sport prepares one to participate in competitions, which are of no harm to either life or health. There are people responsible for that – referees, doctors, trainers. The place where the competition is held is full of spectators and fans. It is only expected that the level of mental pressure in such a situation is completely different from one, in which you have to fight for your life and health on a dimly lit street against several attackers, each of whom might be armed with a bat, a knife or a knuckle-duster. The main index of the difference is the heart rate. 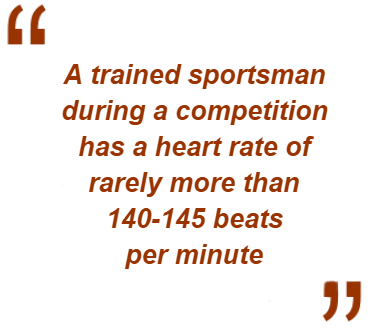 A trained sportsman during a competition has a heart rate of rarely more than 140-145 beats per minute. In an extreme situation the heart of any unprepared, untrained person beats of no less than 180 and up to 200 beats per minute. Even a sportsman, acting self-assured during competitions, is as helpless and apt to be scared in life-threatening situation as any other person. There are no referees and trainers and it is not a prize that they have to fight for against the opponents of the same size and professionalism, but their own life and wellbeing that are claimed by those presumably numerous and armed, with no rules followed, but any brutal and treacherous moves approved. What Is the Reaction of one’s Brain and Body, When a Person Is Faced with Some Real Danger? The brain on the sight of a life-threatening situation cuts the scale and the volume of information it has to process. This is the reason why most of us in such a case get too excited. After crossing a certain line, our system shuts too many information channels making us helpless. When the heart rate is above 145 beats per minute, some serious problems with body control arise. Complex motor abilities are no longer at their full capability. It should be mentioned that the range at which we can function effectively is in between 115-145 beats per minute. The upper line of 140-145 is only suitable for trained people. For others the range is 120-130 beats per minute. Yet we’ve mentioned, that at a stressful situation the heart rate soars to 180 beats per minute and above. What happens to our system then? At 175 beats per minute, the processing of information is shut down. The forebrain is blocked, while the midbrain – the part that is identical to the brain of animals (that is present in any mammal) activates and hijacks the functions of the forebrain. In such a state the bowels are often emptied – at such an extreme level of danger our system doesn’t think such physical control necessary for survival. In a state like this the objective of the body is different: the blood rushes from the external muscles and flows to the internal ones. Our system is evolutionary predisposed to this reaction – it is aimed at turning the muscles into some kind of an armor to cut down the blood loss in case of a wound. However, it makes us practically helpless and transfixed in the process. In the USA, for instance, people are advised to rehearse dialing 911, as there’ve been a lot of cases when in an extreme situation people were holding the receiver unable to perform this simple action – press three buttons. We assume you’ve understood what kind of situations you have to be prepared for. It isn’t reasonable to believe that the skills acquired at a sports club can be applied in a real extreme situation. Moreover it is even criminal at least to yourself. The duration of the presentation does not allow for the description of life examples, where even those with amazing sports training were helpless in life-threatening situations. Yet such cases are numerous, and if you want to you can always find them by yourself. Among them is a story of a famous fighter Ivan Poddubny, who fell victim to a street robbery, and a story of one of the founders of modern karate Masutatsu Oyama, who was mugged by black thugs in USA (he described it in his autobiography) and a lot of other similar cases. Probably you or your acquaintances also have a story to add to the list. The SECOND important difference is the rules. However rigid the rules of the tournament are, they exist even in ultimate fighting. Even there it is not allowed to push out eyes, crush joints or kick in the crotch. Yet these are the actions that are taken in a real fight in the first place. Sports are to be spectacular and entertaining, real fight – effective. So the objective differs. As the objectives are different, the training must be different as well. There goes the THIRD important difference – the contents and methods of training. We are aware that in any martial art taken as a sport there are rules. Therefore, these rules define what is to be trained and learned by a sportsman. In boxing – hits, defense, maneuvers, tactics. In wrestling – thrusts and toppling, mat wrestling, tactics etc. In addition to everything one needs a high level of functional and specific physical training,..
lacking which many complex coordinator moves are impossible, as well as, for instance, keeping on in the ring for five rounds. Any kind of sport DEFINETELY has a program of several years training including a number of stages for the training. The initial stage is usually the group of basic training. The successful students then are transferred to intermediate training groups. The most gifted students are later transferred to advanced groups to step up then to the expert groups. Mastering techniques and tactics of any sport martial art is impossible in three months or even half a year. It’s years and years of training you are to be prepared for. Moreover, the training is based on the pyramid principle. The base of pyramid is the maximum number of moves and their combinations to be learned by a sportsman. The vertex of pyramid is the optimal set of technical and tactical combinations individual for a particular sportsman. In other words, one learns as much as possible as a beginner, and uses about 20% of that as a professional. In the Kadochnikov system it wouldn’t be possible even if we wanted to use it. Thanks to the rules of sports we are able to create a model of any technical moves and use it to train a sportsman. It is impracticable in real life, as there could be one opponent as well as a number of them, they could be armed or not etc. This is the reason we can’t afford to create stereotypes of moves and combinations. The only way out is to teach your body to move so that to react immediately and interact in any situation with one or multiple opponents against any type of cold steel. And to do it fast, without spending dozens of years on training. The FOURTH difference is the extent and the intensiveness of the physical exercises. In sports the objective is to make the sportsman reach the peak of his physical shape for the main competition of the year. For that the whole training cycle of the year is separated into stages – macro- and microcycles, consisting of periods of intensive load, recuperation and next period of load. To fulfill the aim not only pedagogical, but also pharmacological means are used. Everything for getting there – winning at the main tournament of the year. Meanwhile one should always be prepared for an extreme situation, at any time of day or night. could perform in an extreme situation if it is necessary to fight for their life and wellbeing or for their loved ones. We do it by using no more than 25% of the strength. Here goes the FIFTH difference of the Kadochnikov system from the martial arts taken as sports. Using 25% vs 100% of your strength to effectively perform at any state for as much time as it is necessary. In the Kadochnikov System we use no more than 25% of the strength. The SIXTH difference is more connected to the thinking than to the movement. Despite the facts that tactics are an important part of sport fighting, its application is even wider than that of the tactics of a single round in sports (competition tactics included) and in sports fencing, for instance, there is such a concept as a strategic doctrine of a fencer, it still is limited. You must have guessed already, what are the limitations. Indeed. These are the rules of the competitions. In our system we can’t afford even the slightest of limits neither in tactics nor in strategy. Because the training is aimed at surviving and performing the task. For you, for instance, such a task is to counter an attack of a mugger, while cutting risks of injuries to the minimum, without getting injured or hurt. For this we use all the recourses at hand at the moment, skillfully applying the principle of trinity of strength (Physical, mental, intellectual). Finally, we can’t but mention the SEVENTH important difference, which functions in various environments. Getting someone prepared to perform in the same environment, under the same conditions, will not allow them to perform in a situation, where the conditions are not as comfortable. Falling on a soft carpet is not the same as falling on the asphalt or down the stairs in a house. Knowing how to negotiate the stairs, having prepared your body for softening its corners, you’d definitely be at ease with falling on a soft surface, while the opposite is hard to believe. We’ve discussed only seven main differences of the Kadochnikov system from the martial arts taken as sports. There surely are more of them. Thanks to the new set of home learning materials “Your personal safety technique. The secret formula of effective self-defense”. This new set of learning materials consists of a step-by-step guide for those who are ready to go deeper and master the fighting algorithms of personal safety technique, situational self-defense and hand-to-hand combat in practice, following simple and easily applicable guidelines. We are literally going to take you by the hand and lead you through all the basic skills, uncover lots of their secrets, teach you tricks and ruses we ourselves use to maximize the effect, and share a great deal of unique information you’ll never find anywhere else. We made this program as detailed and easy to grasp, as possible. We’ll start with some basic rules, the initial elementary principles and concepts. Then we’ll gradually master each of the basic algorithms, one by one. So, you’ll practically get the knowledge as a set of learning materials. It’s a very versatile product. We do not mean that this is high-level knowledge. On the contrary, it’s something that you just need to do. We are very attentive to every detail of this learning program. We show you everything from every side, taking even finest points into consideration. Indeed the general picture is the first to be painted, but then we take it all to pieces and scrupulously describe everything that you are to do. As we’ve already mentioned, the manner of the description is such that you’ll easily grasp it. You’ll learn it all step by step. The only thing you have to do is to follow the instructions we’ll give you. You’ll manage, we can guarantee that. We tell you and show you what you have to do, how to do it as well as where to apply it, when you finish the course. What Does Our Set of Home Learning Materials “Your Personal Safety Technique” Consist of and Why Do You Need It? This new videocourse is a full-fledged learning and practical system, that allows you to lower the level of anxieties, efforts and money spent on your safety and health. It consists of 6 video modules in digital format (more than 5 hours of video). Videocourse "Kadochnikov System - Best self-defense drills"
So you can get an AMAZING present after signing up for the new set of learning materials. Do not forget it is completely risk free, as you have our famous more than 100% guarantee. Judging by the sole worth of the set of learning materials, it can’t be less than a thousand dolars. Yet we understand that not all the members of our community can afford such an investment even in their own health and safety. That is why we settled on the minimal price suitable for us (including the efforts and costs for making the set of materials) – 97 USD. But you won’t even have to pay the abovementioned sum, as the first clients to buy the materials will be able to do it with a 50% discount, for half price! You could ask us why we would do that. It is simple. The thing is if you read this message, you are not here by chance. This offer is for our subscribers only. Only the most active ones get this. Only for such people, the most active members of our community whom we basically work for we offer the chance to get our new set of learning materials “Your personal safety technique. The secret formula of effective self-defense” for half price within the next few days. We think it is quite fair. As an investment in your health and safety, or to say straightforwardly in your future, which is about equal in price to an iron, an electric kettle or a hairdryer, is affordable practically to anyone. The most important thing is that you don’t risk anything at all, as you have our more than 100% guarantee. The money leave your pocket, but they don’t leave your life, as most of spent money does. They’ll come back to you multiplied, even if you apply only a smidgen of the knowledge acquired. To be even more honest, for some people it can be the most profitable investment in their lives. You can keep hesitating, and miss out on the opportunity to multiply you chances to make your life safer in the face of 21st century challenges. Or taking absolutely no risks having our more than 100% guarantee, you can start right now and raise the level of your life. We sincerely hope that you’ll give us a chance to surprise you with the secrets we unveil in the materials. It’s time to make a decision. The number of the sets on discount for our subscribers is limited, and they will end quite soon. We hope you’ll manage to order a set before there is nothing left. We can’t wait to help you get equipped with new knowledge, thanks to which you’ll be able to raise the quality of your life and safety to a new level at any age. YES! I would like to make my life safer in the face of the 21st century challenges. I will receive a digital homestudy course which consists of 6 instructional modules (more than 5 hours of video) which I will be able to immediately download to any device (PC, Mac etc.) from your website and watch online. As a special bonus I will receive the videocourse "Kadochnikov System - Best self-defense drills". I don`t risk anything because I have your 60 days money-back 100% guarantee. P.S. To feel internal uncertainty concerning one’s ability to defend oneself and one’s family when necessary is an awful life scenario for a person with dignity and self-respect. We hope that the program on psychological training for the combat actions will help you to feel self-confidence; to be sure that if somebody is hostile or aggressive towards you, you’ll be able to withstand them; to win against any rival and neutralize any conflict situation.